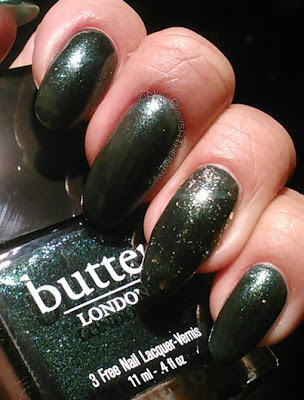 Butter London Jack the Lad, If you thought I was done hauling Butter London think again. Ulta had a 20% off anything in the store until Christmas Eve and for the first time I was able to use the coupon towards some Butter London colors. 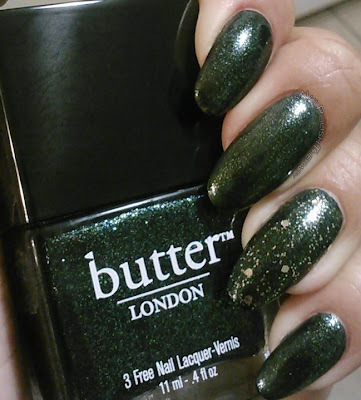 There are only 2 times a year when their coupons are valid on Butter London colors, so I was taking advantage. I had admired Jack the Lad on a few other bloggers sites and decided to get that, along with Lady Muck, Muggins, Fash Pack, Dosh and Marrow. 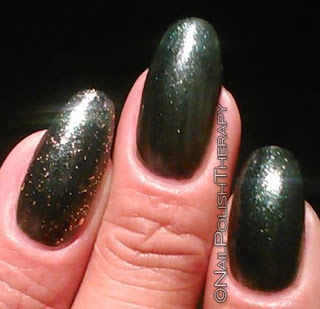 Jack the Lad in the bottle is a gorgeous emerald green packed with gold, green and blue mica glitter. While this sounds beautiful the consistency is too thin for my taste. I wish it were more like Wallis, but it wasn't. It applied pretty streaky and I thought I was ok with 2 coats, but then in the light as I was photographing it I could see the patches. 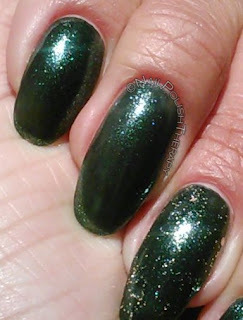 Nevertheless the color is beautiful and next time I'll just add a 3rd coat. On the ring finger I added LA Colors Dizzy for a little extra something. What are your thoughts? feelings? concerns?